Fun and sporty the via ferrata combines the challenges of vertical trip with the fun of monkey or himalayan bridges and geant zip lines… a guaranted adrenalin moment ! The via ferrata are accessibles to a large public but require a basic knowledge of equipment and specific technic of climbinb. In that respect, a proffessional guide is highly recommended. The routes are equiped with a permanent cables, fixed ladders, anchorage points which make the crossing safe and ease the progression . A safety line ensures the safety on the whole route. To make more playful the itinarary, himalayan bridges, monkey bridges, foot bridges and zip lines will leave you an unforgetable souvenirs. Panoramic view and garanteed adrenalin !! The routes are of difficulties varied according to the choice and the level of the participants. The certificate guide will teach you basics techniques to go forward and explain how to use equipment. Motivation, courage and good advices are enough to discover the most beautiful via ferrata of the French Riviera ! 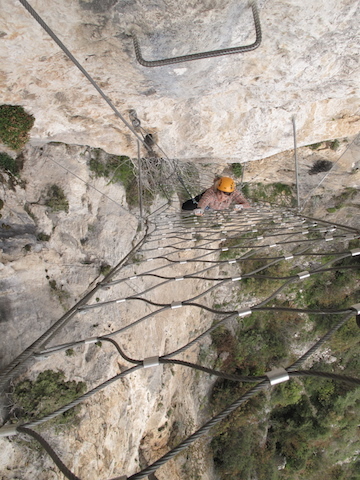 The Via ferrata of Puget-théniers allows vertical route which follow a beautiful cliff of limestone and cross three peaks which dominates the valley of the Var and the medieval city of Entrevaux. An impressive 360° view of all the valley !! Very pleasant to inter season because very sunny. 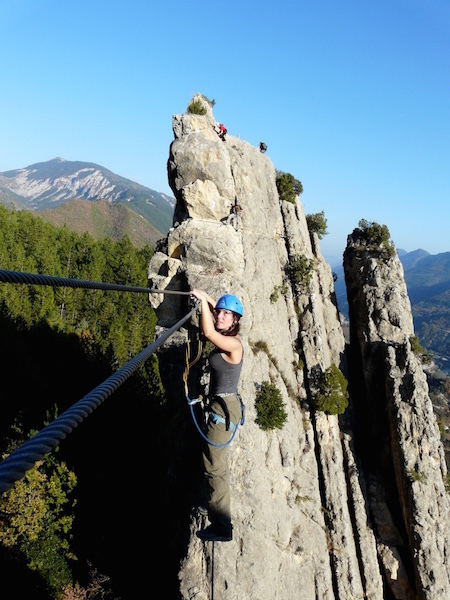 Via ferrata » Canyons of Lantosque » proposes an outstanding route which follows at first the narrow canyon of Riou then the beautiful river of the Vésubie. Numerous crossings (wood bridges, monkey and himalayen bridge) follow one another in an almost tropical atmosphere of canyoning to finish by a great zip line of 100m. Via ferrata of Peille » l’escale » allows an original route which starts directly from the village and whichup gradually by offering a fantastic view over the back country of Monaco and Nice. Filled with a medieval atmosphere this route is divided into 4 very different sections, with a possible exit before each part.